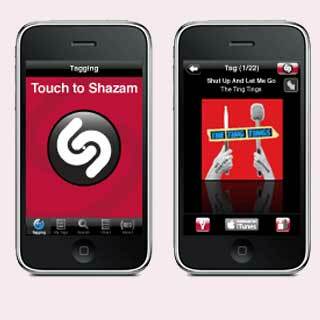 Shazam is an iPhone application that tells you the name of any song that you are listening to. Photo courtesy of mobiletor.com. Pandora Radio- A great radio player that lets you discover new music. People used to wait for the radio to present new classics- no more. You can look up a song on Pandora and it will identify other songs by artists you may or may not know that are similar. AIM-Instant messaging wherever you go. What more is there to say? Facebook Mobile– This app highlights the growing influence of social networks, but is also notable for how easy it is to use. You can check your friends’ statuses and your own profile in seconds-literally. Skype– The revolutionary internet program that allows you to make calls to anyone, like a telephone. Tap Tap Revenge– The iPhone’s adaptation of Guitar Hero and Rock Band allows you to play your favorite game anywhere. Tweetie– Twittering has become revolutionary, letting just about anyone, from protesters in Iran, to ordinary high school kids, update their friends and network with the latest. Stanza: the iPhone E-Reader– E-Readers have become very popular as our world becomes digitized. Amazon’s Kindle and Barnes and Noble’s Nook are only two examples of companies’ bets on a digitized-literate world. Bejeweled 2: the new solitaire– This app is not solitaire but just as addictive and distracting. Yahoo rated it as the top game of the decade, and for good reason- while solitaire was the greatest procrastination game of the past, bejeweled has replaced it. Sudoku Free– Sudoku has been all the rage as a mind-provoking game, and the iPhone’s free version lets you do as many as you want- on the go. Shazam– Ever keep hearing a song and really want to know what it is? Well, Shazam fixes all those problems by using sound-recognition software that identifies any and all songs when you hold up your iPhone to the radio. If you haven’t realized, the only apparent way to see the text about the apps is to highlight it. Please fix this. Great blog at https://www.theblackandwhite.net. Thanks for great article about Iphone. I recently became an owner of Iphone and I love it a lot. I will bookmark your blog as well. Thanks for all the work.